New video offers glance at turn-based combat. Last year, Battletech’s Kickstarter campaign asked for $250,000 to “bring classic turn-based Battletech back to the PC.” After just one hour, it had hit that goal and after just one month it had accrued almost $2.8 million. 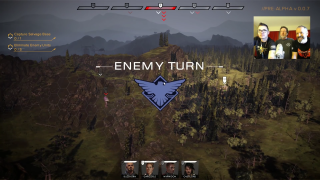 Fast forward half a year and Shadowrun developer Hairbrained Schemes appears ready to show off some of Battletech in working order—the latest alpha footage focused on combat. Dubbed "super pre-alpha", the following developer-led video explores the game’s turn-based combat, its strategies and the various phases players will negotiate on the battlefield. It runs for over 20 minutes and although this sneak-peak was put together “for backers only”, one Reddit user posted the video earlier today. If any of that piques your interest, Battletech is heading to Gen Con 2016 in Indianapolis this weekend—if you’re able to make it along, you’ll have the chance to trial a demo. If you missed the Kickstarter campaign, you can become a late backer by heading this way. May 2017 remains Battletech's estimated release date, as per its Kickstarter page.